Kundalini Yoga is an ancient yoga that helps practitioners thrive in modern times. With the incorporation of asana (postures), breath work, mantra, and meditation - it is a dynamic yoga that can challenge and uplift. It is a powerful yoga that works to strengthen clarity of mind, peace of heart, and physical vitality. Kundalini means 'consciousness,' which every class is designed to expand. Each class of Kundalini yoga will be different depending on both the teacher's style as well as the particular sequence of the day. Most of the exercises in Kundalini Yoga are done with the eyes closed. Closing your eyes offers the opportunity to connect with yourself at a deeper level. In Kundalini Yoga there are thousands of set sequences of asanas known as kriyas. Each kriya has a particular focus (ie. immune system, hormone balance, relieving grief, etc). All kriyas though are designed to create a balance between body, mind, and soul. Although many of the asanas will help with physical fitness there is a huge focus on the energetics of the practice. Most classes usually end with a meditation. Just as with kriyas, there are thousands of different meditations.The meditations will typically vary from 3- 31 minutes in length. Before starting your first class, here are some guidelines to keep in mind. If you are new, it is recommended to arrive early to class. Many teachers check in - with either the front desk or directly with the class - to inquire if it is anyone's first time there. This may shape the language and cues the teacher may use in class with this awareness. 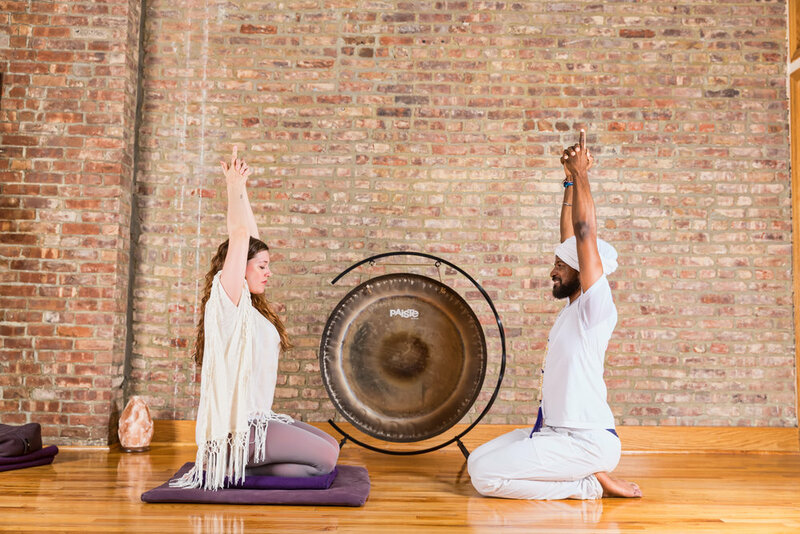 Every class of Kundalini Yoga is open to all levels of experience - including the beginner. As long as you follow the teacher's guidance in the class, the work works. Arriving late is typically not a problem, as long as there is space. Just be mindful to not disturb other students if coming in late. Wear clothes that you feel comfortable moving in. Every studio will be different, so depending on the temperature of the room bringing layers may help. In this particular tradition, it is recommended to wear a head covering and white natural fibers like cotton during practice. These recommendations are to expand the energetic quality of the practice, BUT as a student, wear any color/materials that suit yourself. Eating within two hours before class may hinder your experience. If it’s necessary, eating a small snack like fruits or nuts beforehand is typically okay. Unless the teacher needs to demonstrate - their role is to sit, give clear instruction, and carefully observe the students in practice. This style of teaching is known as "holding the space" which is both in the practical observation of students form and providing motivation when needed - but also the energetic sense of being present in a way that allows students a deep experience. Every Kundalini Yoga class begins with the teacher leading the class with a particular mantra, known as the Adi mantra. The words are "Ong Namo Guru Dev Namo." This mantra is used to deepen your connection to the group as well as personal experience before practice. The best thing to bring to every class is an open mind. Some of the kriyas will push your physical limits; others might push your mental limits. The greatest teacher is your own experience, so allow yourself to follow the cues of the teacher, and approach the practice with commitment. As each class can vary drastically, if the first class you attend isn't a great experience for you, try out at least two other classes. Every Kundalini Yoga class ends with an uplifting song in english known as the "Long Time Sun Song" followed by chanting a drawn out "Saat" and short "Nam." Sat Nam means "Truth is my Identity." Most teachers will stay after class to interact or answer any questions that may have come up during practice. If at any point during the class that you may miss some cues, a good idea is to look at what your surrounding student neighbors are doing. I don’t om. In the dozens of yoga classes I take each year, I never join in the opening and closing om-ing of the class. I can’t really explain why; I have no traumatic history of om-ing. If anything as a former aspiring actress, I am very familiar with saying things in unison with a big group in a shared space. But I always feel uncomfortable joining in this specific step of the beginning and ending of class, so I often choose to listen. So when I was invited to take a Kundalini yoga class, I had some reservations. I could not have been in better hands for my introduction to Kundalini. Golden Bridge Yoga in SoHo was beautiful and calming, with free tea for yogis. The room for our class was comfortable and open. When I came in, the first thing I noticed was how many props everyone had. I am usually a two-block, strap-just-in-case, blanket kind of girl, but people had multiple bean-bag type bolsters, padded mats, multiple blankets, too. So I loaded up my arms and began yogi-nesting in the back of the class next to a wall of exposed brick. I had done no research in advance about Kundalini, although I remembered learning somewhere that the symbol for Kundalini was a snake, and it never appeared to be a class for the casual yogi. There was no specific “beginner” class, so I just signed up for one that was with a recommended instructor. Most other students in my class were dressed in the usual yoga casual outfits. I had not worn white, and had been slightly concerned that I would be the odd black sheep. I felt relieved already. I signed up for another class in an effort to give Kundalini a fair shake, this time a gentle class and had a completely different experience. The instructor, Valerie, was engaging and kind. Since the class was gentle, there was time between poses to fully transition with explanations not only about the upcoming poses with broken-down demonstrations, but also some of the spiritual reasons for the movements. We did a moving meditation with a repeated swinging arm motion/ breath accompaniment for six minutes, but I saw other students take pauses at times so I felt comfortable doing the same. While there were a few chants and the same song at the end, it didn’t feel as pressured—I just hummed and felt like that was enough. At one point during class she even said that you didn’t need to speak out loud, just moving your mouth was able to activate the vagus nerve and shift energy. According to Valerie, “You don’t have to chant, just tune into the vibration of the experience and see how you feel after. And if you feel good, come back.” She further explained how the mantras are all about shifting energy, which is the point of Kundalini yoga, as opposed to the specific physical goals of other types of yoga. When class ended, I specifically thought maybe this could work. I’m still unsure if Kundalini is the right yoga for me, but I can enthusiastically encourage taking a gentle or beginner class as your first one. Kundalini is very different from the typical yoga experience and can be intense. But if you come with an open mind and feel comfortable taking each part of the class as an experience, even the most jaded student can enjoy the energetic movement, both physical and spiritual, of a Kundalini class.